Nestlé Purina Has Built One of the Best Companies for LGBTQ Workers. Here’s How. For three years now, the Human Rights Campaign, the largest LGBTQ civil rights group in the U.S., has awarded Nestlé Purina with a perfect score on its Corporate Equality Index. The organization’s national benchmarking survey scores businesses on their corporate policies and practices relating to the LGBTQ community. While we are proud of our perfect score, we’re prouder of the hard work we’ve done to become a welcoming, inclusive employer. We do this because it’s the right thing to do from a moral and business perspective. We firmly believe that all employees — regardless of their sexual or gender identity — deserve to feel welcome at work. And, a workforce made up of people with diverse backgrounds, beliefs and talents brings greater innovation and creativity, helps us understand our consumers, and makes it easier to hire and retain talent. That means creating an LGBTQ –friendly workplace. We’ve been able to attract and retain LGBTQ talent by having policies in place such as non-discrimination workplace protections and domestic partner benefits. We also offer transgender-inclusive healthcare benefits to guarantee all our employees can access the care they need. “Equality is core to our values, and is central to the way we do business, treat employees, and value our consumers. Our people are our most important asset — our mission is to continuously attract, develop, and retain, top talent across various diverse backgrounds,” says Annette Morris, head of diversity, inclusion & gender balance at Nestlé Purina. We empower all our employees to become strong allies for their LGBTQ friends and employees. Our Diversity & Inclusion Ambassadors play a key role in supporting these efforts. They are associates from a mix of different business units and a wide variety of backgrounds and do things like host internal conferences and speakers. The ambassadors recently hosted Beck Bailey, the deputy director of employee engagement in the Workplace Equality Program at the Human Rights Campaign Foundation. Bailey’s discussion, “The Cost of the Closet and the Reward of Inclusion” focused on building greater workplace equality. We know that to be true allies, we need to think about supporting our LGBTQ employees beyond the workplace. We want to build a more inclusive environment everywhere. More than 70 Purina associates, friends and family recently volunteered at PrideFest in downtown St. Louis near our corporate headquarters. Besides being a lot of fun, participating in the PrideFest shows that when it comes to supporting our LGBTQ employees we are committed to action, not just rhetoric. Purina has also been supporting Saint Louis Effort for AIDS through its PAWS (Pets Are Wonderful Support) program since 2013. In that time, we’ve donated more than $45,000 to help provide resources to people living with HIV/AIDS so that they can keep pet companions as long as possible. Donations from Purina help supply people living with HIV/AIDS with pet food, medications and veterinary services for their pets. 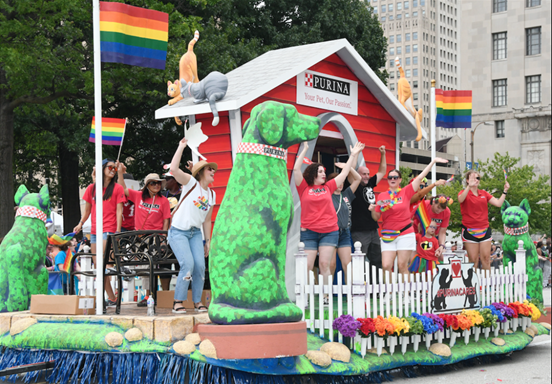 Like volunteering at PrideFest, featuring LGBTQ families and individuals in our marketing and packaging signals to the world that Purina is serious about supporting the LGBTQ community. We believe the diversity of pet owners should be reflected in the images we use on our packaging and in our marketing campaigns. And we are in a position to do just that. Creating LGBTQ friendly workplaces is smart because it makes sense for your bottom line. More importantly, it is the right thing to do and it makes you, and your employees feel good. Want to come work with us at Purina? Check out our job openings at: jobs.nestlepurinacareers.com. This article has been reposted from Medium and 3BL Media news. Laura Lee is Senior Manager of Digital Communications at Nestlé Purina. © 2019 3BL Media & TriplePundit. All rights reserved.